FEAST Toronto is a series of community dinners and funding events. People are invited to present proposals for art- or design-based projects. Everyone attending votes on which project they would like to fund, and the project with the most votes is given a grant raised from the ticket sales. 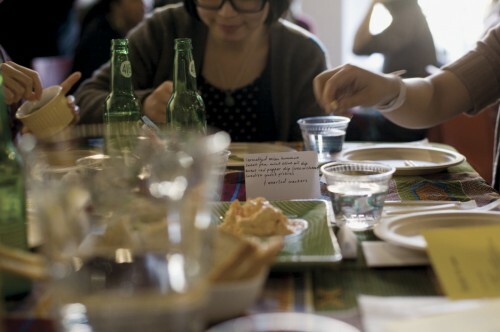 At each FEAST Toronto dinner, tickets are sold for people to attend the event. The money raised from these ticket sales goes towards funding the winning project proposal, as chosen by the attendees. Our partner Xpace Cultural Centre also donates a separate student grant of $300, which is awarded using the same voting process. Co-founder Amber Landgraff saw a “menu” written by Brooklyn’s FEAST explaining how one would go about starting their own FEAST event. Inspired by the openness of the process, Landgraff approached Deborah Wang to bring the project to Toronto, adapting it to fit the needs as they saw within their own community. Landgraff and Wang, collaborating with artist and chef Lisa Myers, partnered with Xpace Cultural Centre on the project to provide space for the dinners to take place. The first FEAST Toronto event was launched in January 2011. Have you ever been met with resistance or criticism for micro-funding? What specifically were the concerns, and how did you respond? Some criticism of micro-funding models is that they can’t replace a healthy government grant system, as they only provide small-scale grant amounts to projects that often require more funding than is possibly raised. The benefits of these kinds of projects however have to do with bringing community decisionmaking processes to the table, and developing face-to-face and one-to-one relationships with communities and the projects that are directly funded. Two of the major challenges that FEAST Toronto encountered had to do with finding space to host the project and with building a sustainable model given that all the labour put into FEAST has been unpaid. First having to do with space, FEAST Toronto has been able to build a long lasting relationship with their host Xpace Cultural Centre, such that Xpace has taken on many of the back-end costs of making FEAST run, so larger grants can be awarded at each event. However, Xpace’s location is limited in size, so the number of attendees at each event is fixed. Attempting to find a larger host site has the potential of opening up the number of attendees at each event, and therefore the amount of money raised by ticket sales. However, that could also be detrimental because the pre-existing support systems would be less available at an alternative site. The event itself is run by a dedicated group of volunteers, which is unsustainable long-term. FEAST Toronto has an emphasis on supporting emerging projects, and ones that might not otherwise be able to get funding through more traditional or government funding models. Interestingly enough, FEAST is itself unable to get funding through these channels. What is the most important insight you gained specifically through funding in this way? What’s the most important insight you gained specifically through funding in this way? What’s the best piece of advice you’d give to a funder curious about doing something similar? The most interesting outcome of the project has actually been about developing community support, and the face-to-face relationship that develops during each dinner event. While not all projects that present are able to get the funding during an event, other kinds of support have happened during dinners, including people hearing about projects they liked but that didn’t win and then following up with offers of help, space, and other support. Being open to having the goal of a project reveal itself to you over time is helpful in keeping projects ongoing long term. Part of the goal of starting FEAST Toronto had to do with thinking about how people with very small amounts of money could pool their resources and accomplish more together as a group. Bringing together a group of people to share a meal and talk about ideas, and to develop those relationships between the people funding projects and the projects that are funded has been an incredibly rewarding experience.